Detailed model kit of Robert Downey, Jr.'s Iron Man Mark 7 from Marvel's Iron Man 3! Requires glue and paint, not included. Bring home Tony Stark's Hall of Armor! This Iron Man 3 Mark 7 with Hall of Armor 1:9 Scale Model Kit features a detailed, life-like sculpt of Tony Stark's Mark 7 suit! If you're a Marvel Comics fan, reader, or simply know one, you can't go wrong adding the Golden Avenger to your collection! 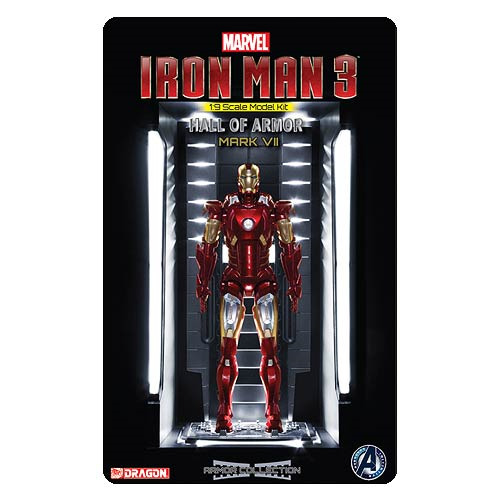 The Iron Man 3 Mark 7 with Hall of Armor 1:9 Scale Model Kit requires glue and paint, not included. Ages 14 and up.